The plan for the Hosmer School campus presented to the School Building Committee on Jan. 23. it shows the brand new school, and three parking areas. The cost estimate for rebuilding two of Watertown’s three elementary schools — while the third is thoroughly renovated — came in close enough to the price of the alternative of renovating the three schools for the School Building Committee to recommend going for the new construction option. Representatives from project designer Ai3 Architects and owners project manager Daedalus Projects presented the cost estimates at the Jan. 23 School Building Committee meeting. 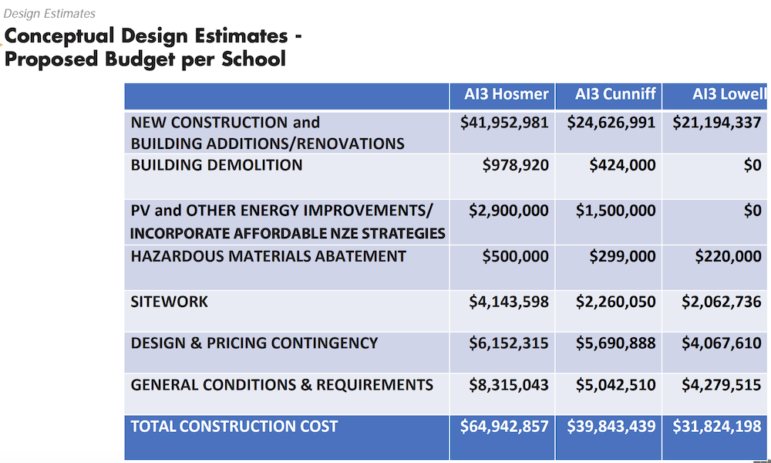 The decision to explore the cost of building two new buildings for Hosmer and Cunniff schools came after the cost of renovation came in higher than originally projected. In November, the Committee heard an estimate of $153 million for renovating all three buildings. At its most recent meeting, the Committee learned that building new schools at Hosmer and Cunniff and thoroughly renovating Lowell School would cost $169.8 million. Along with brand new buildings, the new schools would also be much more energy efficient and would generate energy through photovoltaic (PV) solar panels on their roofs. The cost estimates pleased Town Council President Mark Sideris, who also chairs of the School Building Committee. Before the projects can become a reality, however, the School Building Committee will have to find the money to pay for it. Unlike the proposed state-assisted Watertown High School project, the Town of Watertown will fully fund the elementary school projects. In October 2018, Town Manager Michael Driscoll announced the Town could afford to pay for the elementary school projects without increasing local property taxes by shifting money that had been used to pay down Watertown’s deficit in pension benefits. That deficit is scheduled to be paid off in Fiscal Year 2020. Originally, he pledged up to $120 million. In November, however, the estimate came in significantly higher at $153 million which would have had some additions but mostly renovations. The newest number, $169.8 million, includes two brand new buildings for Hosmer and Cunniff and a third school — Lowell — receiving significant renovations and two additions. The Lowell would not get the solar panels. Town Council Vice President Vincent Piccirilli said that, despite the higher price tag, the latest proposal would be a good investment. 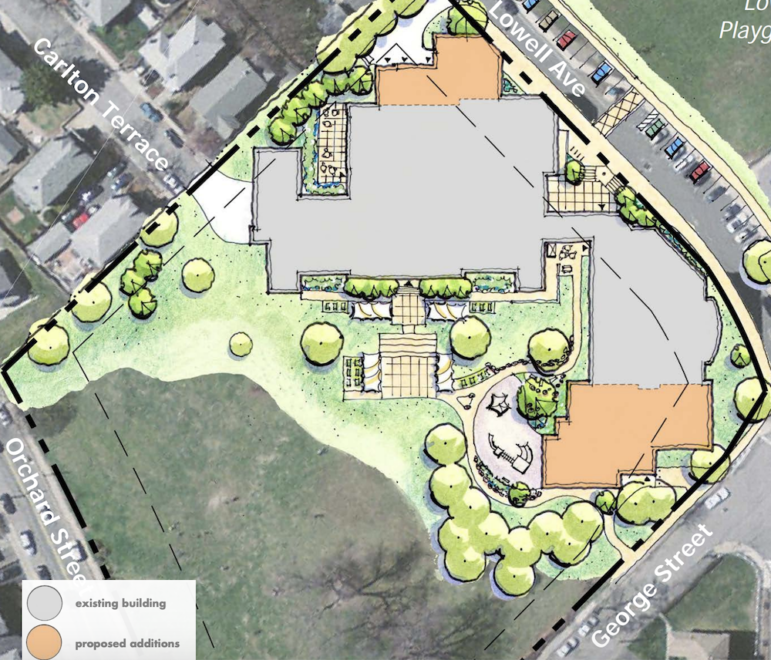 The School Building Committee voted unanimously to endorse the conceptual and schematic designs, and the cost estimate, and refer it to the Town Manager for his consideration. They also took a second vote to allow Sideris to represent the committee and meet with Driscoll. “This will authorize myself and (Ai3’s) Scott (Dunlap) and Shane (Dolan of Daedalus) to go over this with the Manager, so we can explain where we are and basically say that we really need this money,” Sideris said. School Building Committee member Leo Patterson said he wanted to be sure that district would get what it wants at Lowell School if it only undergoes renovation, saying that this is the time to get it right. The current building will be completely renovated, in some cases down to the studs, while a classroom wing will be added on the east end (near George Street) and a multipurpose room will be added onto the current gym, Dunlap said. The plan for a renovated Lowell School, with additions shown in orange. The top one is a multipurpose room and the one on the right is a classroom wing. Superintendent Dede Galdston said that the renovated school will feel new inside, and will have the facilities that the new schools have. Lowell Principal Stacy Phelan said that one of the big additions will be the new multipurpose room, because it will allow two classes to have physical education (PE) classes at the same time. It will allow new activities, such as yoga, in PE classes, she said. In addition, Phelan said, the school will be grouped by grade level, which will be an improvement. 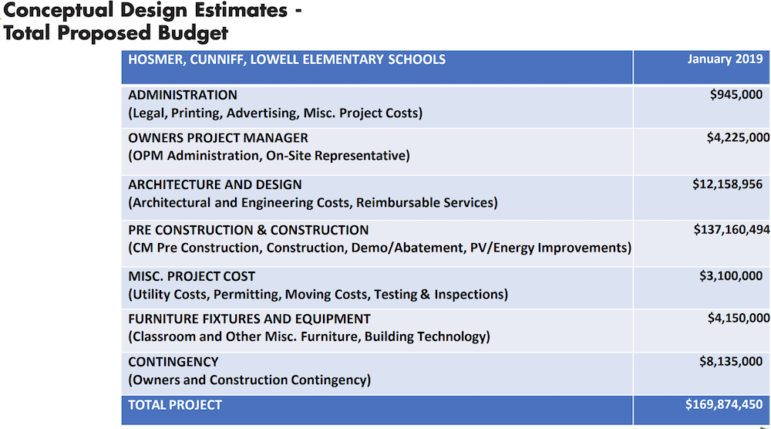 The cost of renovating Lowell ($31.62 million) is not that much less than constructing a new school at Cunniff ($38.8 million). However, Dunlap said that the Lowell’s size of 90,000 sq. ft. with 20,000 sq. ft of addition, is significantly bigger that Cunniff (79,000 sq. ft.). Dunlap presented slightly different plans for Cunniff and Hosmer from the plans brought forward earlier in January. 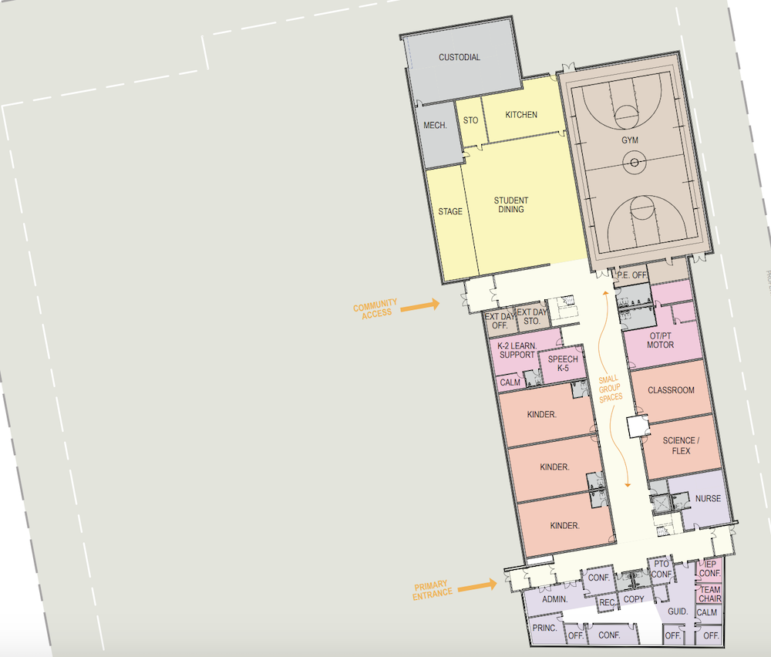 The plan for Cunniff now has the gymnasium and cafeteria on the first floor of the school, instead of having the gym floor in the basement level and the cafeteria above it. Dunlap said the decision was made to go this way to give better access to these areas by the public, so the areas can be used for activities such as voting. It would also eliminate the need for a second elevator at the school to meet American Disabilities Act requirements. A plan of the first floor of the proposed new building at Cunniff School, with the cafeteria (in yellow) and gym (in brown) located on the first floor. There were not such significant changes for Hosmer, but Dunlap presented a complete campus plan, including parking areas along the drop off area, between the field and the Brigham House and in the area that is now a gravel parking lot along Boylston Street. At Lowell, the question of parking still remains. Dunlap said the school would lose 26 parking spaces due to the new additions. 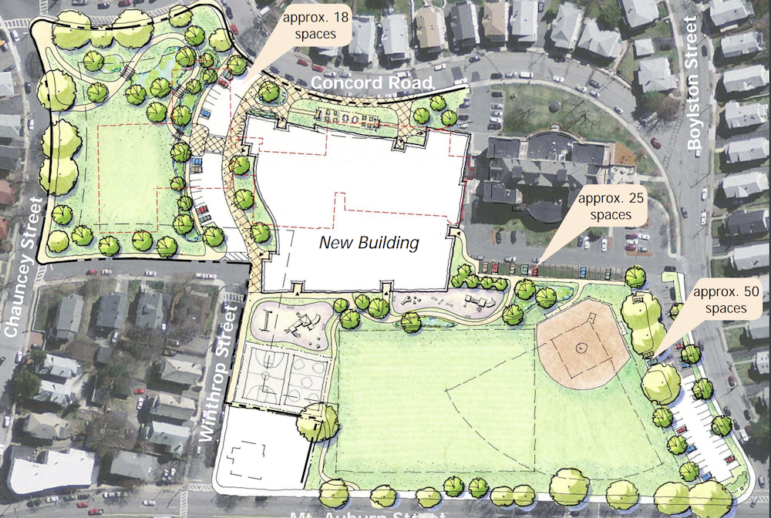 He showed plans to add about 10 spaces along Lowell Avenue, up against the playing field. The entire elementary school construction project will take about four years to complete, according to a schedule shown to the School Building Committee by Dunalp. With the plan to build two schools and renovate the third endorsed by the committee, the next steps in the process will be hiring a construction manager and a commissioning agent, Dolan said. The order of the construction of the schools, Dunlap said, will have Hosmer going first, because the old building will serve as swing space for the other schools while their buildings are constructed and renovated. Lowell would go next, he said, because it could be occupied while the project starts, and then students move over to Hosmer during the renovation. Finally, the Cunniff would begin. The next School Building Committee meeting is planned for Feb. 6, 2019. See the presentation from the Jan. 23 School Building Committee meeting by clicking here. Shall we start a contest to see how long tht $169 million lasts before it hits $200 million? I would like to thank the School Building Committee for all the work they put into this project. Aside from an initial lack of community notification-which was more than compensated for once it was realized-they listened carefully to citizens concerns and ideas and incorporated many of these concerns and ideas into their final recommendations. The preservation of green-space was one of several major concerns of town residents and they knocked the ball out of the park on this issue. Another major concern was parking. and on this issue they exceeded the communities expectations for the need for adequate parking with en eye to encouraging other means of travel such as walking and bicycling. As an abutter to the Hosmer school my enthusiasm for the project far outweighs the anxiety I feel at the prospects of a major several years construction project at my front door. I owe this to the School Building Committee and to the many citizens who participated in the process and for this I say thank you. I watched the same logic for the Newton North HS project. The estimate for the new HS was $110,000,000 while the addition & remodeling was $86,000,000 so they decided to build a new HS. The final cost was closer to $200,000,000. It was amazing how many items they destroyed in building the new HS which were not figured in the original estimate.